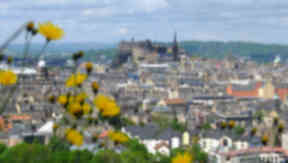 Male life expectancy in Bankhead area of Edinburgh is 74.4 years, compared to 82.6 years in Balgreen. Men living in one part of the capital can expect to live almost 11 years less than those living just two tram stops away, health chiefs have revealed. 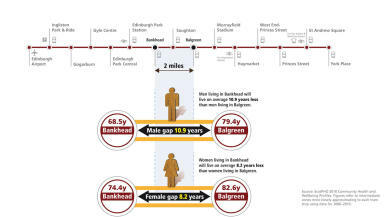 While men living in the Bankhead area of Edinburgh have an average life expectancy of 68.5 years, in Balgreen - which is only two miles away - that rises to 79.4 years. The gap for women is not quite as large, at 8.2 years. Average life expectancy for females in Bankhead is 74.4 years, compared to 82.6 years for their counterparts in Balgreen. NHS Health Scotland highlighted the difference between the two areas ahead of a Holyrood debate on health inequalities. Public health information manager Andrew McAuley said: "Despite being only two miles apart, the gap in average life expectancy at birth between those living in the nearby residential neighbourhoods to the Bankhead and Balgreen stops is, on average, almost 11 years for men and eight years for women. "This reflects the very different social and economic circumstances which impact differently on the two communities. "It provides further evidence that more work has to be done - by policymakers, local government, the NHS and other service providers, community groups, and employers - to address inequalities and close the gap in quality and length of healthy life between individuals." Jamie Hepburn, minister for sport, health improvement and mental health, said: "In order to solve health inequalities we need to get to the root cause of inequality. "Scotland is leading the way in embedding the pursuit of equality at the heart of our social policies. "This includes promotion of fair work and a living wage, and helping more women and disabled people into the labour market. "We are also investing in health and educational attainment so we can tackle the root causes of poverty, and working to ensure that the benefits of economic growth are felt right across Scotland."